This is a sort of Gold Book Rescue story. The two great women that were rescued because they were 165 miles from home, no relatives available. Just me. And I was more than happy to help them after they lost an alternator, near Lake City, FL, on their way back from the Chili Cookoff in Bryson City, NC. When you have an oversize Hannigan Trike, a good size trailer behind, you do not just take any trailer to pick up a downed bike pulling a trailer. Liz called me late morning, and said they were having problems, but was going to get another battery to see if that would help. Liz being the self-supported, mechanically inclined person that she is. I had no doubt that she would be able to interchange the battery ok. A while later she called again. They were on the side of route 75, just south of Lake City, FL. From the first call, I had a rescue plan. 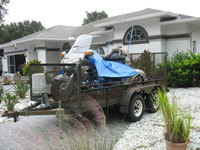 I loaded my 2-wheel GL1800 on the open- trailer that I have, that would fit their GL1800 Trike. The trailer that they were pulling would not fit on my trailer, and too heavy to lift in the truck. That's why I loaded my bike to go north. I pulled the trailer up there with my truck, unloaded my bike, hooked their trailer behind my bike, and then loaded their trike on the trailer. Liz is a fair driver, so Liz and Rose drove my truck back to Lakeland behind me, pulling their trailer with no tail lights due to a miss matched electrical plug. She now keeps the universal plug in the trailer for emergencies. After several hours of driving, loading, and a couple of stops, we finally made it home around midnight. Nothing unloaded yet, that's for tomorrow. 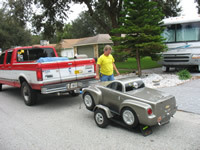 The next morning, I took the trailer to their house behind my big Ford truck, to be able to pick up the big trailer that held their trike. Now the problems in between. My utility trailer has been around for over 15 years and the floor was not in very good shape with 1 x 6 lumber. I busted one center board loading my bike to go north to get them and had to use pieces of plywood to support the wheels between the support beams. I took extra pieces to put under the trike wheels, and when Liz was driving the truck back, every bump was a quick look in the mirror to see if the trike was not dragging the ground underneath. It was their decision that they were going to put another floor in my trailer, and we did the next day. They were insistent, so I wound up with a 2 x 10 floor, with the stipulation that we had to be friends for the next 10 years in case we had to use it again. They said it was cheaper than having the tow truck bring it back. A flatbed tow truck took them off route 75 to the next exit, and it helped to have towing insurance-You never know. These gals are the kind of people that you would stay friends with for life, no matter what, due to their kindness, and willingness to help others, and GWRRA. Liz is the Chapter Director of FL2-W, in Winter Haven, FL and the friendship that we all have makes it the best Chapter around. I am proud of them and the Chapter. For the Gold Book info, I now have a good trailer to haul any bike for rescue, if needed.